Read our interview with Judith Silver, the founder of 'Companion Voices', a group that brings comfort and connection at the end of life, through music. Companion Voices has been around as a group for about three years. Did it start as a group, or did you begin on your own? JS: I did sing at my friend Nina Maraney’s bedside in the summer of 2012, that was what gave me the final prompt to start a group, but I'd had the idea for probably ten years or more. I had heard of a group over in the US, led by Kate Munger - now a whole enterprise called Threshold Choirs - and they do that, they sing at bedsides. I heard about them all those years ago and it really resonated with me. So I don't know if I had the idea myself and then heard of that, but it was a big influence in my even thinking such a thing could be done. What is the main driving force for you in doing this? JS: It's been a wish for so long. And as time goes by, and as I'm singing with more people and meeting more people who feel drawn to the idea, I'm understanding that there's something of myself that I'm working through, something to do with life and death, to do with how to live, how to deal with the death of people around me, how to deal with preparing for my own death. Because it's becoming more apparent to me as I get older that there's nothing about death that is surprising, and yet, as far I know, in the cultures that I'm familiar with there's not much really good preparation, and [death] is still quite a taboo. Less than it used to be, though. AS TIME HAS GONE BY, I’M REALISING MORE AND MORE THAT WE, THE ACTUAL PARTICIPANTS IN THE GROUP, ARE JUST REAPING SO MANY BENEFITS FROM SINGING IN THIS WAY. Not that it works perfectly all the time, there's no such thing, I suppose, but they're very deep experiences and what we witness, when we sing, is a kind of a shift in the energy of the room - sometimes the person in the bed can't respond at all, but other times it's just incredible to witness the spirit of somebody who, even if they're in that, kind of unthinkable position, they can find the energy to joke with us, give us feedback about our singing, say how much they've loved it, thank us for coming in. Visit Judith's website to learn more about Companion Voices. I'm struck by how removed we are from each other, from elements of life such as dying, and also from music - we have sort of compartmentalised music to particular realm. It belongs to those with “talent” or those with training. So I want to ask you about the group acting at someone's bedside, in a sense, as a community. How do you think about that? JS: Bringing community to somebody's bedside - yes, absolutely. 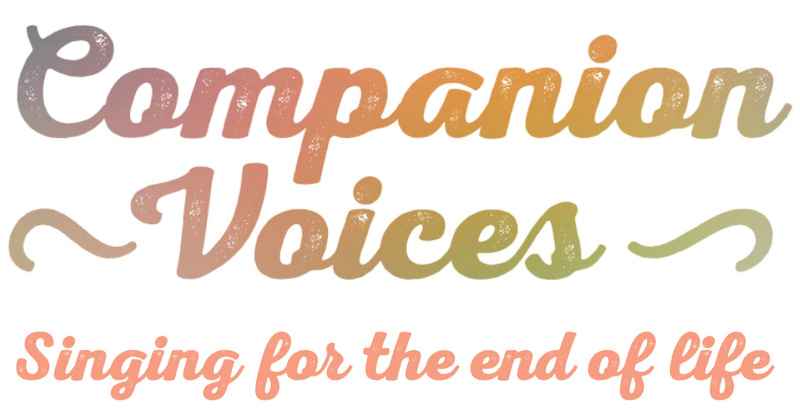 I mean, companionship... we thought really hard about the name 'Companion Voices', because, when I started working in Brighton it didn't have a name, and for a year we were just singing together, just calling it a 'Bedside singing group'. We started collecting ideas in that group and we really thought hard about what we were trying to say with our name, and I think being 'companions' on that journey is what we want and using our voices to try and bring a sense of that to people - bring some comfort and connection. I agree with you that there is something weird in the society that we live in, where people die in this way. Have you come across the book 'Being Mortal'? A lot of people are reading and talking about that now. I've just finished it and lots of people have recommended it to me, and it's by Atul Gawande. He talks about how so many people are dying in hospitals and away from home, in an unfamiliar environment with machines all around, with lack of privacy, etc. It's not really what most people want, it's just what happens. One of the big challenges is just letting people know... trying to explain to people what this is, because as you can hear, it's really hard to crystallize, and it's outside most people's range of what they've come across and what they would expect, or they wouldn't even know to ask for it. How do you see the relationship and was it part of the creation process, between Companion Voices and Jewish values and tradition? JS: I did find it a funny thing... although I'm Jewish and very involved with my Judaism and with the Jewish community, quite honestly for the moment, Companion Voices is a non-denominational project for me. I know that it will be possible in the future for Jewish groups or other specific groups to form from the bigger idea. And the repertoire that I choose sort of reflects that, so I choose songs from many different traditions and they are broadly lullabies from different places, songs of spirit if you like... so they have, either in English or in other languages, soothing, reassuring words and ideas. If we're called in to sing to someone and we know that they are Christian or that they are Jewish and a person of faith, we're very open to bringing in the songs that we know that might resonate. But there's also the whole question about whether you want to be bringing in something that is familiar in some way, which might just feel like pulling the person back towards what they know, at that moment where they need to be able to move forward, and... my jury is completely out on that one, because in some ways I think that singing something like Rozhinkes mit Mandlen - a beautiful Yiddish song, that might just be something that someone's grandmother might have sung to them... maybe that would be an incredibly soothing, wonderful thing to sing to them, but it is pulling them back in some way. That, I still don't really have an answer to. There's a lot of instinct about it, when we go into somebody's room or also, when we're practising, between ourselves, we already get a sense of how songs feel different and different things happen when we sing them. 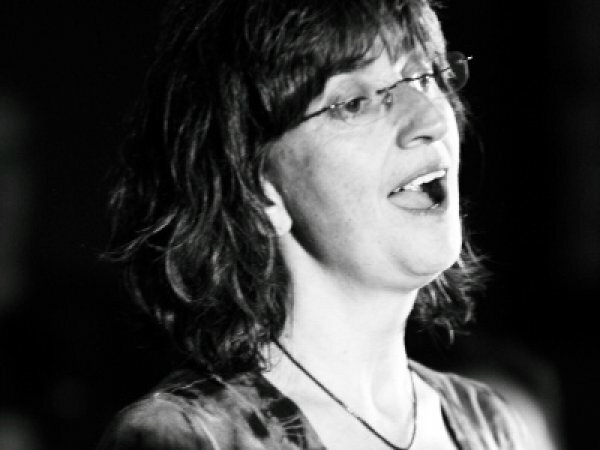 How do you see the position of music and singing within Jewish life? And why is it that you try and bring music to Limmud and such places? ONE OF THE SPECIAL THINGS IS TRYING TO BRING OUT PEOPLE’S CONFIDENCE AND JUST HELP THEM TRUST IN THEMSELVES AND TRUST IN THEIR VOICES. To enjoy singing together and trying to let go of the self-consciousness and the old messages… So many people have terrible old messages like 'I can't sing'! Usually that just means that somebody said something when they were younger and they took it on board, even though it wasn't really true. So a lot of my life is spent devoted to trying to help people understand that even though they use the phrase 'I can't sing', it doesn't really mean 'I can't sing'. It just means that maybe they don't naturally know how to pitch their voice correctly without help, for example. What are some of the songs from Jewish tradition that have made their way into Companion Voices? JS: One of the first things I taught the group in Brighton was the Niggun of Hashiveinu... 'Hashiveinu... hashiveinu... Adonai eleicha...' it's really beautiful, I think. We sing it as a round, we've just brought in the words, because it works so beautifully as a wordless melody. And also I've done two or three Niggunim. We sort of improvise harmonies to that, it's lovely. And we've done one of the beautiful Shefa Gold's meditational pieces, Kosi R'vaya.